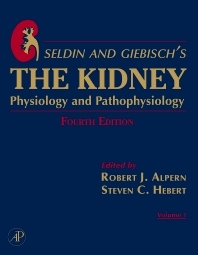 A classic nephrology reference for over 20 years, Seldin & Giebisch’s The Kidney, is the acknowledged authority on renal physiology and pathophysiology. The fourth edition follows the changed focus of nephrology research to the study of how individual molecules work together to affect cellular and organ function, emphasizing the mechanisms of disease. With over 40 new chapters and over 1000 illustrations, this edition offers the most in-depth discussion anywhere of the physiologic and pathophysiologic processes of renal disease. Comprehensive, authoritative coverage progresses from molecular biology and cell physiology to clinical issues regarding renal function and dysfunction. If you research the development of normal renal function or the mechanisms underlying renal disease, Seldin & Giebisch’s The Kidney is your number one source for information. Offers the most comprehensive coverage of fluid and electrolyte regulation and dysregulation in 51 completely revised chapters unlike Brenner & Rector's The Kidney which devotes only 7 chapters to this topic. Includes 3 sections, 31 chapters, devoted to regulation and disorders of acid-base homeostasis, and epithelial and nonepithelial transport regulation. Brenner & Rector's only devotes 5 chapters to these topics. Previous three editions edited by Donald Seldin and Gerhard Giebisch, world renowned names in nephrology. The title for the fourth edition has been changed to reflect their considerable work on previous editions and they have also written the forward for this edition. Over 20 million adults over age 20 have chronic kidney disease with the number of people diagnosed doubling each decade making it America's ninth leading cause of death. Academic and medical librarians in kidney physiology, nephrology and renal medicine. This will also serve as an excellent reference for clinical nephrologists and trainees, graduate students, researchers, academic clinicians and any pharmaceutical company working on renal medications. For full table of contents please see the link on the right below the blue bar "Look inside". Dr. Alpern has performed research in the area of epithelial physiology, focusing on the mechanisms and regulation of acid transport. He received his MD degree from the University of Chicago and then trained in Internal Medicine at Columbia Presbyterian. Following postdoctoral training in the Cardiovascular Research Institute at the University of California, San Francisco, Alpern joined the faculty at UCSF, then moved to the University of Texas Southwestern Medical School as Chief of Nephrology and later Dean of the medical school. He is now Dean of Yale School of Medicine and Ensign Professor. Dr. Steven C. Hebert is the C.N.H. Long Professor of Physiology and Medicine at Yale University School of Medicine in New Haven, Connecticut, USA, and Chair of the Department of Cellular and Molecular Physiology. Dr Hebert’s research interests include salt and mineral metabolism, especially calcium and magnesium homeostasis, the renal handling of potassium, the diuretic-sensitive Na/K/Cl cotransporters and epithelial salt and water transport. Dr Hebert cloned and characterized the calcium-sensing receptor, the renal potassium secretory channel, ROMK, the thiazide-sensitive Na-Cl cotransporter and the loop diuretic-sensitive Na-K-2Cl cotransporter. Dr Hebert has served on the faculty of the University of Alabama, the University of Texas, Harvard Medical School-Brigham & Women’s Hospital and Vanderbilt University Medical School. Dr. Hebert was elected to the American Society for Clinical Investigation, the Association of American Physicians and the National Academy of Sciences of the USA. Amongst several awards, Dr Hebert has received the Carl W. Gottschalk Award from the American Physiological Society and the Homer W. Smith Award from the American Society of Nephrology and New York Heart Association and the A.N. Richard’s Award of the International Society of Nephrology. Dr Hebert has been editor, or on the editorial boards, of numerous physiology, membrane biology and renal-related journals. He is the author of over 260 peer-reviewed papers, reviews, book chapters and books.